There is plenty of parking in front of the bar but also around the corner by the Hotel Port Denia. Book a table on the terrace for fantastic views of the beach and Mediterranean. 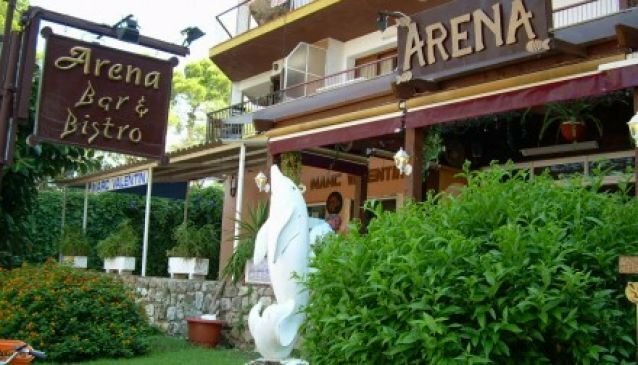 The Arena Bar is a friendly bar with a large terrace overlooking the beach. You can enjoy great food, drinks and company while taking in the breathtaking views. The bar opens at 10am when you can enjoy a drink, snack or breakfast. There is an a la carte menu as well as a set lunch and dinner menu. On Sundays, there is live music plus a buffet in the afternoons from 3.30pm. The food is superb with a good selection of meat, fish and pasta dishes. Diners keep coming back for the delicious spare ribs. You can enjoy a drink at the bar or terrace to just chill out in this great setting. There is live music twice a week - on Wednesday evenings and Sunday afternoons. Sunday afternoons are great for chilling out with sea views, live jazz and a hot or cold buffet, if you fancy something to eat.